(Nanowerk News) The most magnetic mineral on Earth, magnetite, cleans water contaminated by heavy metals. Current textbooks say the associated reactions start on the mineral’s surface. The changes have not, up to now, been directly observed. Now, a team imaged the surface and mapped the reactions. They found that reactions increase the magnitude and variability of tension and defect formation. The results show how these reactions on the surface of magnetite particles can trigger internal structural changes (Nature Communications, "Oxidation induced strain and defects in magnetite crystals"). These changes are sensitive to the reaction environment. That is, different strains and defects form depending on whether the particles are in an acidic liquid or air. Better understanding surface changes—which affect reactivity—could benefit future studies into magnetite and other iron oxides. Insights into these oxides is vital for environmental science and materials science. Solid-water interfaces are primary sites for physiochemical phenomena in natural and technological systems, especially for reactions that occur at or near ambient conditions. Iron oxides, such as magnetite (Fe3O4), are vital to geochemistry, environmental science, and materials science. The iron oxide magnetite plays a beneficial role in aqueous environments, such as cleaning up water contaminated by heavy metals, and in recyclable geochemical batteries. Magnetite oxidation and reduction (redox) reactions transform magnetite into maghemite, an iron oxide, with a nearly identical crystal structure. Current understanding says these reduction-oxidation reactions originate at the magnetite surface by the formation of a maghemite shell. But reactions that appear to be simple can be surprisingly complex. The changes in the magnetite lattice from reduction-oxidation cycling have not, up to now, been directly mapped or observed. Further, little is known about how individual defects forming within a crystalline grain affect the overall magnetite lattice. A team of researchers used the X-ray capability of Bragg coherent diffractive imaging at the Advanced Photon Source to create 3D images of magnetite nanoparticles and study the changes in the particles’ crystal structure, such as compression, tension (strain), and growth of lattice defects. 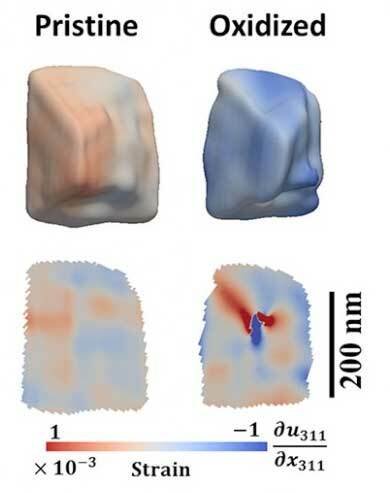 Using these images, the team spatially resolved the changes to the internal structure of individual magnetite nanocrystals (~300 nanometers in size) during oxidation reactions. When magnetite undergoes oxidation in an acidic solution, the amount of internal strain increases, and the region of strain contains greater variability–both compressive and tensile components due to the formation of discrete defects. These dissimilar strain elements likely result from diffusion of iron ions in the crystal lattice, causing distortion. The changes in strain are much less pronounced and more uniform when magnetite undergoes oxidation in air (at elevated temperatures). These results demonstrate that oxidative dissolution of magnetite can induce a rich array of strain and defect structures that depend on the reaction environment. Also, the strain and defects are expected to modify the reactivity of magnetite particles.